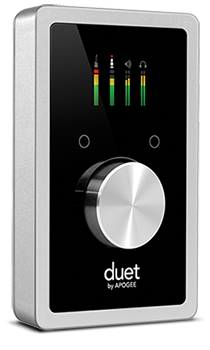 This video shows you how to set up Duet 2 in Logic and begin recording quickly. Open Logic and create a new session. For now set the buffer to 128. For best latency you can set the buffer lower, but you may need to adjust the buffer higher depending on the size of the project you are working on. Click on “Apply Changes” and close the preferences window. In Logic, you can also customize how the I/O labels appear. Duet’s I/O labels will show up in Logic’s channel strip. “User” allows you to name the Inputs and outputs anything you like, With the exception of out 1&2 which is always “Stereo Output”. +4 and -10 bypass Duet’s mic pre amp and is a direct line level connection to the A to D converter. “Mic” is for connecting a Dynamic, Ribbon, or Condenser Mic to Duet’s XLR breakout cable. If you are connecting a Condenser mic, you will need to click on the “48” button to turn phantom power on. “Instrument” is for connecting a guitar, bass, or keyboard to the 1/4″ instrument input. In the Output section you can select how you want to route Duet’s four outputs, assigning them to the Main or Headphone outputs. Click on Logic’s “Record Enable button” you will now hear the input source you have plugged in.